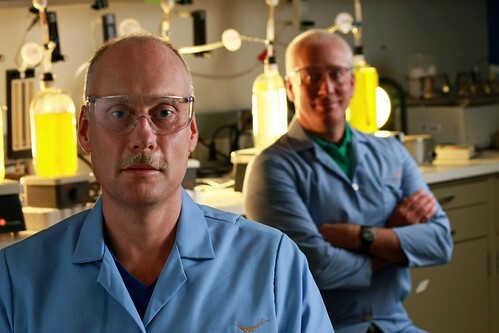 PNNL researcher Michael Huesemann (front, left) is leading a multi-laboratory project that is developing a new streamlined process to quickly pare down heaps of algae species into just a few that hold the most promise for making biofuel. PNNL's Laboratory Environmental Algae Pond Simulator system, also known as LEAPS, mimics the frequently shifting water temperatures and lighting conditions that occur in outdoor ponds at any given place on earth. This allows researchers to test multiple algae strains with the conditions at different places, but without the cost and time needed to actually grow them at those locations. 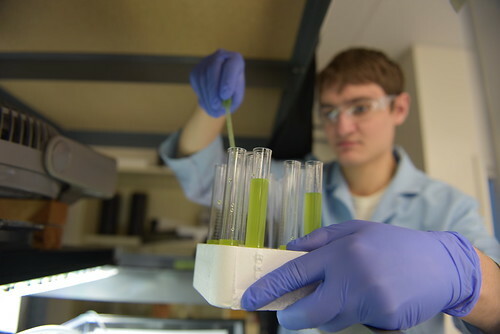 PNNL biochemical engineer Mattias Greer examines algae samples for their suitability to make biofuel. SEQUIM, Wash. — A dozen glass cylinders containing a potential payload of bright green algae are exposed to hundreds of multi-colored lights, which provide all of sunlight's natural hues. The tiny LEDs brighten and dim to mimic the outdoors' constantly changing conditions. To further simulate a virtual cloud passing overhead, chillers kick in and nudge the algae a little cooler. 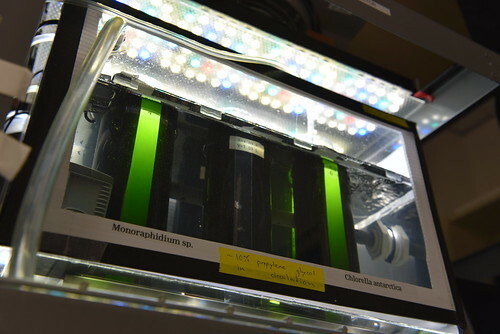 The Algae DISCOVR Project — short for Development of Integrated Screening, Cultivar Optimization and Validation Research — is trying out a new approach that could reduce the cost and the time needed to move promising algal strains from the laboratory and into production. At the end of the three-year pilot project, scientists hope to identify four promising strains from at least 30 initial candidates. "Algae biofuel is a promising clean energy technology, but the current production methods are costly and limit its use," said the project's lead researcher, Michael Huesemann of the Department of Energy's Pacific Northwest National Laboratory. "The price of biofuel is largely tied to growth rates. Our method could help developers find the most productive algae strains more quickly and efficiently." The project started this fall and is led by PNNL, out of its Marine Sciences Laboratory in Sequim, Washington. The project team includes three other DOE labs — Los Alamos National Laboratory, National Renewable Energy Laboratory and Sandia National Laboratories — as well as Arizona State University's Arizona Center for Algae Technology and Innovation. The project's early work relies on PNNL's Laboratory Environmental Algae Pond Simulator mini-photobioreactors, also known as LEAPS. The system mimics the frequently shifting water temperatures and lighting conditions that occur in outdoor ponds at any given place on earth. The system consists of glass column photobioreactors that act like small ponds and are placed in rows to allow scientists to simultaneously grow multiple different types of algae strains. Each row of LEAPS mini-photobioreactors is exposed to unique temperature and lighting regimens thanks to heaters, chillers and heat exchangers, as well as colored lights simulating the sunlight spectrum — all of which can be changed every second. The first phase of the team's multi-step screening process uses PNNL's photobioreactors to cultivate all 30 strains under consideration and evaluate their growth rates. Algae strains with suitable growth will be studied further to measure their oil, protein and carbohydrate content, all of which could be used to make biofuels. The algae will also be tested for valuable co-products such as the food dye phycocyanin, which could make algae biofuel production more cost-effective. The first phase will also involve evaluating how resistant strains are to harmful bacteria and predators that can kill algae. Next, the team will look for strains that produce 20 percent more biomass, or organic matter used to make biofuel, than two well-studied algae strains. The top-performing strains will then be sorted to find individual cells best suited for biofuel production, such as those that contain more oil. Those strains will also be exposed to various stresses to encourage rapid evolution so they can, for example, survive in the higher temperatures outdoor ponds experience in the summer. After passing those tests, the remaining strains will be grown in large outdoor ponds in Arizona. Researchers will examine how algae growth in the outdoor ponds compares with the algal biomass output predicted in earlier steps. Biomass will also be harvested from outdoor-grown algae for future studies. Finally, the team will further study the final algae strains that fare best outdoors to understand how fast they grow in different lighting and temperature conditions. That data will then be entered into PNNL's Biomass Assessment Tool, which uses detailed data from weather stations and other sources to identify the best possible locations to grow algae. The tool will crunch numbers to help the team generate maps that illustrate the expected biomass productivity of each algae species grown in outdoor ponds at any location in the U.S.
Data and strains will be made public in the hopes that algae companies and other researchers will consider growing the most productive strains identified by the project. Potential future work not included in the current project could include converting harvested algae into biofuels, examining operational changes such as crop rotation to further increase biomass growth, and assessing the technical feasibility and economic costs of making biofuel from algae selected through this process.